What Is Healthy to Eat at Carrabba's? The homemade tortillas are just one reason why many people enjoy a meal at Café Rio, a Mexican chain restaurant located mostly in the western United States. The restaurant offers a variety of fillings to turn the tortillas into burritos, as well. With a focus on fresh ingredients, Café Rio can also be a nutritious place to eat a quick meal that provides a good dose of vitamins and minerals. A 6-inch flour tortilla has 150 calories and 5 grams of fat, of which 1 gram is saturated. A 12-inch flour tortilla contains 420 calories and 14 grams of fat, of which 3 grams are saturated. The wheat tortillas have slightly more fat and calories. The saturated fat content of your Café Rio meal matters because eating large amounts of saturated fat can raise your cholesterol level, according to the American Heart Association. Opting for a 6-inch corn tortilla will cut these numbers to 70 calories and just 1 gram of fat, though you'll increase your sodium intake from zero milligrams to 140 milligrams. An order of tortilla chips has 232 calories and 14 grams of fat, of which 3 grams are saturated. If you want a burrito filling low in saturated fat, opt for the beans and rice in your burrito. A 4.5-ounce serving of black or pinto beans contains between 140 and 150 calories and between 2 and 2.5 grams of fat, of which only 0.5 gram is saturated. Mahi mahi contains 90 calories and only 0.5 gram of fat. The fire-grilled shrimp or shredded chicken breast each contain 90 calories, though the shrimp is lower in fat. The pork and beef fillings are good sources of protein, and they have between 100 and 120 calories per 2-ounce serving. 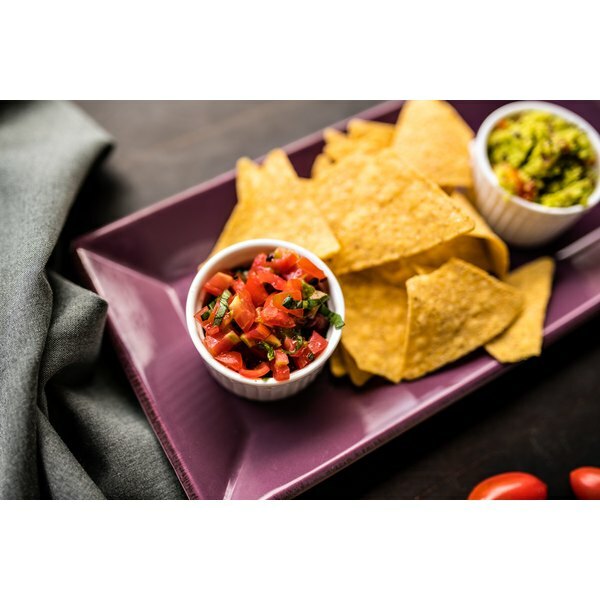 An ounce of salsa fresca is one of the best toppings because it has just 20 calories and zero grams of fat. Lettuce, cabbage or cilantro are low-calorie and fat-free, as well. The green chile, red chile, tomatillo sauce and mango sauce are low in calories and contain 0.5 gram of saturated fat or less per serving. Reconsider the cilantro lime dressing, which has 170 calories and 14 grams of fat, of which 2 grams are saturated. The creamy tomatillo dressing has the most sodium with 480 milligrams per serving. A side of cheese will add fat and calories to your meal, but it will also add protein and calcium. Too much sugar can lead to weight gain, and the desserts at Café Rio definitely fall into the too much sugar category. An order of chocolate flan contains 42 grams of sugar and coconut flan or tres leche cake each have 47 grams of sugar per serving. The worst offender is the lime pie, which has 65 grams of sugar per serving. This translates to 11.25 teaspoons of sugar, which is more than your entire limit for the day.